CAPTION: Team members from ZON-PTC and Mevion gather to celebrate the first patient treatment. 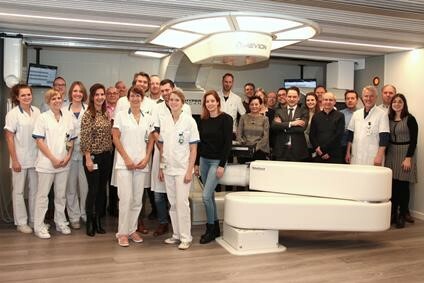 The Zuid-Oost Nederland Protonen Therapie Centrum, (ZON-PTC) at the MAASTRO Clinic in Maastricht, the Netherlands, has become the first center in Europe to provide proton therapy to patients utilizing a compact, single-room system. The center features the MEVION S250i Proton Therapy System® with HYPERSCAN® Pencil Beam Scanning and an integrated in-room cone beam CT system, the ImagingRing™* from medPhoton. Mevion’s streamlined installation allowed the clinicians at ZON-PTC to begin treating patients in less than a year from cyclotron delivery. Moreover, with the industry’s smallest footprint, the proton system was embedded directly into the radiation therapy department in a narrow space between two clinical buildings. This enables ZON-PTC to share existing resources and expand the treatment options available at the MAASTRO Clinic. MAASTRO Clinic begins proton treatments with Mevion system. Appl Rad Oncol.